We are proud to be able to offer our customers the Baby Sara experience. We have carried Baby Sara for several years and the line has continued to provide outstanding quality and cute styles throughout the years. 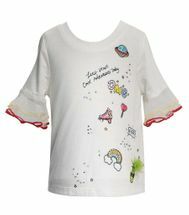 Long lasting designer know how to go with the trending flow, bringing styles that both moms and little girls adore. Their designs are often found in infant to size 6X, allowing her closet to be special from the start and grow with her as she heads to her early school years. Speaking of school years, when school picture time or a new school recital comes around, be sure that Baby Sara is the first place you check. Their darling outfits will pop on camera or the stage, but will remain comfortable and cozy for her to keep on all day long! Many of our customers know that Baby Sara is one of the several lines from the SaraSara company. These lines include Hannah Banana and Truly Me. We know Baby Sara by their sweet lace, unique appliques, and little girls dresses that are perfect for everyday. What better place to start shopping for her back to school look? 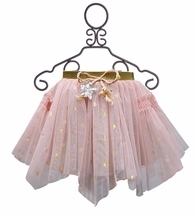 We cannot emphasize the wonderful qualities of Baby Sara clothing enough. We love that they add style and sweetness to her everyday look. These designs begin with classic body shapes and a level of quality that every customer appreciates. With the occasional bright color, most of their outfits and dresses are colored from a muted, feminine palette. You are sure to find soft greys, light pinks and peaches along with classic navy. The pops of vibrant colors are often found in beautiful prints, whether floral, paisley or a fun multiprint. Taking a look at all of the beautiful pieces currently available, you will find several that play with a tulle skirt or a sheer overlay. We love added decorations, like the crochet flowers found on the new arrival, Baby Sara Lace Dress For Girls. These flowers are placed upon lace and bring in new shades to the outfit. 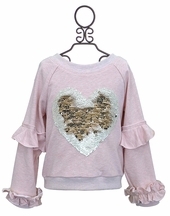 She will also love the sheer lace sleeves that feel extra special to any little girl. One of our favorite creations from their spring 2019 collection is the Baby Sara Denim Shorts with Rose Tank. This fun outfit is available from 12 months to 6X, perfect for the mom who loves her girls to match! The bold, large rose print on the tank is complemented with the beautiful decorative hem created by lace. 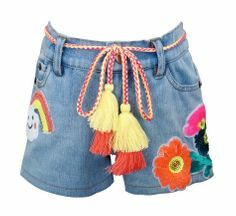 The denim shorts are accented with white lace to match. Both of these pieces are gorgeous on their own, but placed together make an eye catching outfit. During the change in seasons, you can be sure to find the hottest new pieces from Baby Sara on pre order while a great value can be snagged in checking out the Baby Sara sale items from past collections. We know that these clothes will not disappoint when you open up the carefully wrapped order, no matter which collection or season holds the item that sticks out as the perfect look for her. Something to keep in mind when shopping is that even spring and summer items can be layered during the colder months! A matching pair of leggings or a flattering cardigan carries the same clothing through multiple seasons.